Classic cycling style made easy. 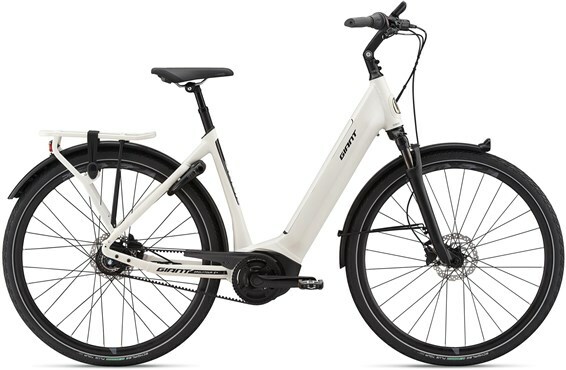 The Giant DailyTour E+ 1 is an electric urban bike that combines the very latest in cycling technology with a comfortable, easy to ride Dutch bike style frame. The crank drive e bike motor and battery pack is neatly integrated into the frame which improves the handling of the bike as well as offering cleaner lines. With a belt drive combined with Shimano 8-speed hub gears and hydraulic disc brakes you get the very best in all-weather reliability. Experience all the latest E-bike technologies including automatic support, navigation and an integrated light system. DailyTour E+ is a fun new way to ride the road. Automatic shifting: With a SyncDrive Life 60Nm motor you have the ability to ride in the smart support mode, which determines the support you need and shifts automatically. Navigation: On-board navigation comes to you via a new RideControl EVO display that’s smoothly integrated with the handlebar. Added visibility: Integrated lights run in all light conditions, day and night, to increase visibility on the road. This high-performance level, state-of-the-art Aluminium material is made predominantly from 6011 alloy and delivers best-in-class strength-to-weight ratios. These framesets also feature unique welding technologies for a high-performance ride quality. SyncDrive Life: SyncDrive Life is an ideal solution for E-bikes with low step-through frames. New SyncDrive Life motors are updated with PedalPlus 6-sensor technology, featuring six sensors including an additional slope detection sensor and an accelerometer. With these additional sensors it is now possible to ride in an auto support mode function, with tuneable support, five support modes and navigation functionality. The result is an extremely comfortable E-bike riding experience. The PedalPlus 6-sensor technology can determine the steepness of a slope while riding. It calculates the amount of torque, cadence, slope and speed and, based on these calculations, it determines the amount of motor output the rider needs. This smart sensor technology offers smooth assistance in the auto support mode functionality. SyncDrive Life also offers quiet and fast performance. It is now four times quieter than the previous version, while still delivering powerful, tuneable support ratios up to 300 percent. The motor reacts within 500 milliseconds to deliver direct support when needed. Smart sensor technology delivers a smooth and natural ride experience and automatically detects the level of motor output the E-bike needs. 60Nm of torque and a 300 percent support ratio delivers enough power to experience ultimate comfort. SyncDrive Life delivers a quiet and smooth riding experience. RideControl Charge: RideControl Charge offers a wide range of possibilities due to the updated SyncDrive Life motor technology. When the E-bike is equipped with the SyncDrive Life motor technology, the updated RideControl Charge lets riders switch between auto support mode and the 5 other support modes, from the energy saving Eco+ mode to the most powerful Power mode. This is ideal for a variety of terrain and ergonomic control buttons make it easy to select and change modes. The RideControl Charge displays the EnergyPak capacity, which power assist mode is being used, cadence, speed and total distance. COMFORTABLE RIDING: With five support modes, you can switch support modes easily and ride a variety of terrain. ERGONOMIC CONTROL: Ergonomically designed button controls offer more comfortable handling. Mobile Device Charging; Allows you to charge phones or other devices on your handlebar with a micro-USB port. PedalPlus 6: Giant’s new PedalPlus 6-sensor technology is used in combination with the SyncDrive Life motor technology and features an additional slope detection sensor and accelerometer. While the PedalPlus 6-sensor technology can detect slopes, it also offers an autosupport mode function, which helps riders experience a more effortless ride experience. This new sensor technology calculates the amount of torque, cadence, slope and speed and, based on these calculations, determines the amount of motor output the rider needs. TORQUE SENSOR TECHNOLOGY: The torque sensor reacts to pedal pressure. The more pressure you apply to the pedals, the more support you get from the motor. It precisely measures this forces that the motor can deliver a seamless power boost. MOTOR AND PEDAL ROTATION SENSORS: Allows the motor to run as smoothly and seamlessly as possible. SLOPE DETECTION SENSORS: Calculates the steepness of a slope the bike is on and the amount of acceleration or deceleration the rider puts in. Based on the slope measurement, combined with the other factors, the system is able to automatically adjust motor output. Accelerometer: Measures the amount of acceleration or deceleration the rider puts in. Based on the amount of acceleration, combined with the other factors, the system is able to automatically adjust motor output. AUTOMATIC ASSISTANCE: Offers automatic shifting possibilities. The motor automatically detects the amount of support the rider needs. EFFICIENCY: Maximises energy efficiency for both the rider and the battery system, optimizing power depending on the slope and saving power on flats. EFFORTLESS RIDING STYLE: The combination of the PedalPlus 6-sensor technology and the instantaneous response of the SyncDrive Life motor creates a smooth and powerful riding experience. Downtube EnergyPak: Future-proof with the new down tube EnergyPak. This updated EnergyPak is mounted in the down tube of our E-bikes. The biggest difference between the side release and top pull EnergyPak is a more minimalist down tube design. This makes it look more integrated and streamlined with the rest of the E-bike frame. With an aluminium casing, a moulded bottom protector and a double lock feature, this Down tube EnergyPak can handle rough rides. It is able to communicate with the charger and has highly innovative cells that are individually controlled by the smart charger. This gives the Down tube EnergyPak a longer lifetime. Heat build-up is managed internally by having double the space between cells giving more temperature control. This makes it safer to handle. This EnergyPak is also easy to access. With one turn of a key, it releases from the down tube and is ready to charge. The EnergyPak is equipped with highly innovative cells that charge to more than 60% within 90 minutes with 6A charger. INTEGRATED DESIGN: The Down tube EnergyPak offers a well-established, integrated design with more minimalist down tube profile. EASY TO OPERATE: Easy and safe to handle, the Down tube EnergyPak has two locks so it can be easily removed without any hassle. SMART CHARGING: Offers smart charging with 6 Ampere charging possibilities that can reach over 60% of capacity in only 90 minutes.